The intermediate size BY10 Robin was introduced in 2006 with stainless steel handles (Robin SS). 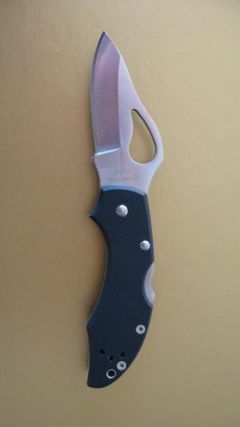 Variations with G-10 handles (Robin G-10) and FRN handles (Robin Lightweight) were introduced in 2007. First comments in the Spyderco forum after the Robin SS was introduced. "The Robin’s intermediate size makes it a winning crossover for both office or weekend carry. Its stainless steel handle is champhered for ergonomic pinch-free cutting that reduces user fatigue and discomfort. The steel handle offers just enough weight to reassuringly remind you it’s in your pocket, ready when you are. Jimping (texturing) at the spine and choil keep the folder firmly in your grip creating more purchase and control even when cutting strenuously or for long periods of time. Hollow-ground, the blade is made with high carbon 8Cr13MoV and available with a plainedge or fully serrated cutting surface. A tip-up/tip-down right- hand pocket clip lets you to clip the folder inside a pocket or waistband." The BY10 are made in China and all have a Back Lock with Boye dent. The Robin G-10 and Robin Lightweight variations have a screw construction. This page was last modified on 28 May 2015, at 18:15.